First popularized by Ladysmith Black Mambazo and Paul Simon, the a cappella music known as isicathamiya has become internationally celebrated as one of South Africa’s most vibrant and distinct performance traditions. But Ladysmith Black Mambazo is only one of hundreds of choirs that perform "nightsongs" during weekly all-night competitions in South Africa’s cities. 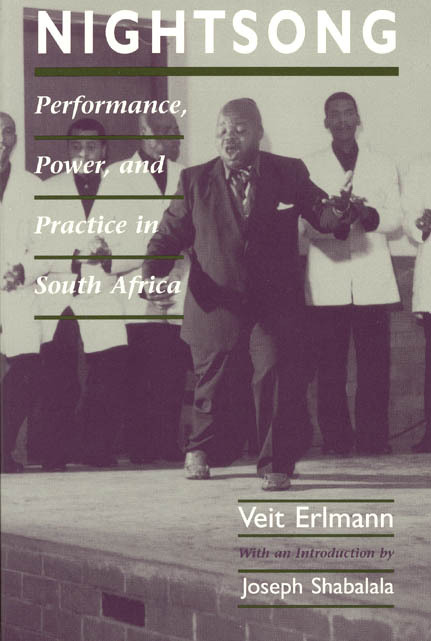 Veit Erlmann provides the first comprehensive interpretation of isicathamiya performance practice and its relation to the culture and consciousness of the Zulu migrant laborers who largely compose its choirs. In songs and dances, the performers oppose the class and racial oppression that reduces them to "labor units." At the same time, Erlmann argues, the performers rework dominant images to symbolically reconstruct their "home," an imagined world of Zulu rural tradition and identity. By contrasting the live performance of isicathamiya to its reproduction in mass media, recordings, and international concerts, Erlmann addresses important issues in performance studies and anthropology, and looks to the future of isicathamiya live performance in the new South Africa. Featuring an Introduction by Joseph Shabalala, the lead singer and founder of Ladysmith Black Mambazo, this book will be essential reading for anyone interested in the study of music, performance, popular culture, or South Africa.